You are here: Home / Advertising / Playnormous Health-Edu Games Offer FREE Monster iMacs! Sept. 1, 2009 How do you improve K-12 student’s health knowledge, inspire creative writing, support eco-values of refurbished technology, and use whimsical hand-painted art of animated monsters to reach and teach? Launch a Playnormous custom-contest of amped up art that looks like it crawled out of a Pixar flick! These computers were briefly used in an obesity research project and are now customized cute critters, a perfect showcase for the school or library that submits the most creative use of their Playnormous health e-games, showing how they’ve impacted students’ attitudes towards exercise, eating, and physical well-being. Want in? Here’s how. They’ll be awarding these FREE monster iMacs to schools monthly, using their innovation for education in this first-ever contest promo. Mind you, the team of researchers, clinicians, health game experts and Playnormous staff are some of the judges so the competition is stiff, but the artful computers are a ‘ginormous’ win. Art teachers and business classes? It’s a hands-on opportunity to show how a product comes to life from storyboard to animation, concept to completion. I’m personally interested in hearing how educators have used the games, since I know Playnormous puts considerable medical and developmental forethought into the ‘casual game’ design and scientific testing of outcomes and measures. So I’d love to glean some ‘best practices’ myself! If I were one of those PTA auction-fundraising folks, I’d start writing my socks off, because if you score one of these beasties, imagine what you could auction it for as a donation item for the school, with parents bidding up the price from FREE to earn the library or school much needed cash and a showpiece item too. I browsed through their gallery of ‘monster iMacs’ and each one-of-a-kind creation has a personality of its own. (all are 100% authentic Apple, built in iSight camera, remote/keyboard/mouse and Intel Dual-core processor etc.) and absolutely FREE to the monthly winners. Ah, but isn’t this ‘brand infiltration’ into schools? No. Here’s why they get a hallpass imho. “Iva’s creation was one of the first Monster iMacs to be unveiled. 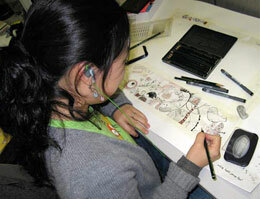 Her design was executed using several interesting types of art media–caffeinated media at that. Iva used orange spice tea and coffee stains to give this computer a soft, sophisticated feel. Red ink was dropped and blotted on key elements to bring the landscape to life. Rubber stamps and an inkpad were used to write the Playnormous name and tagline. And third, this type of cross-platform experimentation to have NON-branded food gaming as teaching tools based on nutrient and category is an informal learning alternative to jazz up health sciences information they’d otherwise be digesting in textbook style. Since then, they’ve really spring-boarded into the healthGAMERS arena in a monster way and made some amazing alliances and progress in the name of kids’ health, so I’m steadfast in supporting them any way I can. …Though this trio of Playnormous tees at left were swapped for S.Y. tees to cross-promote our orgs. I also added their logo/link on our sidebar as a recommended resource, because they ARE one! Soon I intend to write and learn more on their healthGAMERS site too…Quick poll, though…How many of you thought the “featured links” at the right sidebar were PAID vs. PROBONO? Curious, as we haven’t taken a cent and I’m wondering if it should read “Recommended Resources” instead? What makes sense for clarity? As I’ve said so many times, if we go for ‘underwriters’ or paid sponsors/partners YOU WILL KNOW ABOUT IT. Anyway, here’s more, from the Playnormous summer launch letter detailing their back to school promotion for the monster iMacs. So feed the monster, send ‘em some good idea essays, and I’ll publish the best ones here. “We are extremely excited to announce our first ever Playnormous contest. 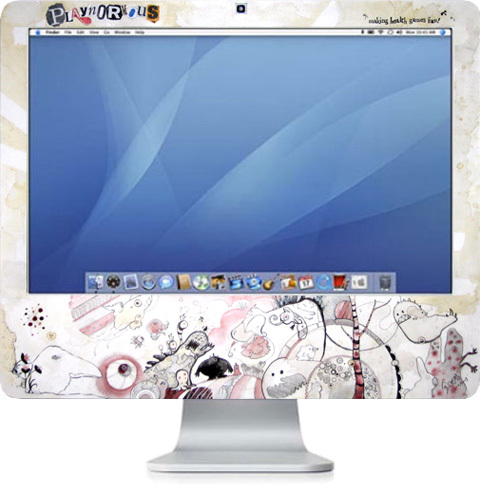 During the 2009 / 2010 school year, Playnormous will be holding its Monster iMac Giveaway. We will be giving away FREE Monster iMac Computers each month to health game playing public K-12 classrooms and libraries across the U.S.
What’s a Monster iMac you ask? It’s a 100% authentic iMac with a hand-illustrated custom shell created by a 100% authentic artist at the Playnormous studio. See the official rules for details on how to win your FREE Monster iMac! We are in the process of putting the finishing touches on our next game Food Pyramid Pile Up. This strategy-based game will teach you and your kids all about what foods go in which food group and how discretionary calories work. Learn what counts as nutritious, not just delicious. Expect Food Pyramid Pile Up on the site in the next month, complete with teacher curriculum and a free printable food pyramid poster. We’ve had a monster amount of press this year. Watch our interview with ABC News, read up on our company at Wikipedia, read our four star review by Common Sense Media, as well as local press like the Houstonist and Startup Houston. Stay tuned for the summer edition of Casual Connect Magazine with a two-page editorial written by our own Playnormous director of marketing. Follow the latest and greatest news at the Playnormous studio by visiting Monster’s Blog, complete with new features like the Bust-a-Health Myth section and a list of our most popular posts. See photos of Playnormous happenings on Facebook and even follow us on Twitter too. For more in-depth information on health games, visit our newest blog, healthGAMERS. Our Playnormous CafePress store is having its annual summer sale where you can save on all of your favorite Playnormous gear. Grab a Healthy Monster Chef Apron for all those summer barbecues or a Feed the Monster Bib for your favorite little monster. As a special thank you for joining the Playnormous mailing list, we will be giving away a FREE Playnormous t-shirt to the first 10 recipients who link to our website. Simply visit the buttons page, copy the html of your choice, and paste it into your blog or website. Reply to this message with the link, your name, mailing address, and size (YM, YL, S, M, L), and we’ll get that shirt out to you asap. Remember, shirts will be given on a first come first serve basis to the first ten respondents. Kids Health & Nutrition for Back to School Days! Mayo Clinic: Vegetarian Diet, Can It Help Control Diabetes? Really excited about this! Will get this on over to Pulse + Signal as well! .-= Andre Blackman´s last blog ..Internships at Shaping Youth + Envision Solutions =-.